Are you overwhelmed by disorganization in your home? Some families deal with disarray in every room of their homes, and don't always know how to remedy it. Need a simple, sure-fire fix, without adding on to your home? Think vertically with a shelving solution. Read how shelving solutions can instantly create space in every area of your home. A common problem in kitchens is the lack of space for storing things like cookbooks, not-often-used appliances and serving bowls. This is especially difficult if you have minimum of cabinet space. A freestanding shelving unit that fits into a corner of your kitchen or against a wall can accommodate over-sized items, keeping them accessible, while freeing up cabinet and counter space for regularly used items. Items like book bags, shoes, umbrellas, jackets — even sports equipment — inevitably pile up right next to the door that everyone in the family enters. Add a shelving solution to corral all of those items and keep the entryway clutter free. Add a hanging rod for coats and jackets and hooks for umbrellas and backpacks. Setting up a system like this near your main door will also help reduce clutter spreading to other areas of the home. As more and more families are spending more time on their devices searching for everything from ordering take-out food to researching movie times, it's helpful to create a station that family members can easily access. Wall-mounted shelving solutions are available in attractive finishes to complement your home's décor and you can create a highly efficient, space-saving station by thinking vertically. Make an immediate impact on the organization and appearance of your bathroom by removing items from the countertop and storing them on wall-mounted shelves instead. Wall-mounted shelves are available in a variety of fashionable materials and look great while organizing your toiletries and other bath necessities. Corner shelves are ideal for super small bathrooms. Make room for two cars in your two-car garage by maximizing the full potential of the wall space with shelving. Getting items up off of the garage floor will make a tremendous impact on the amount of space you save. Look for a modular system like Elfa to hold lawn and garden equipment, tools and car supplies. 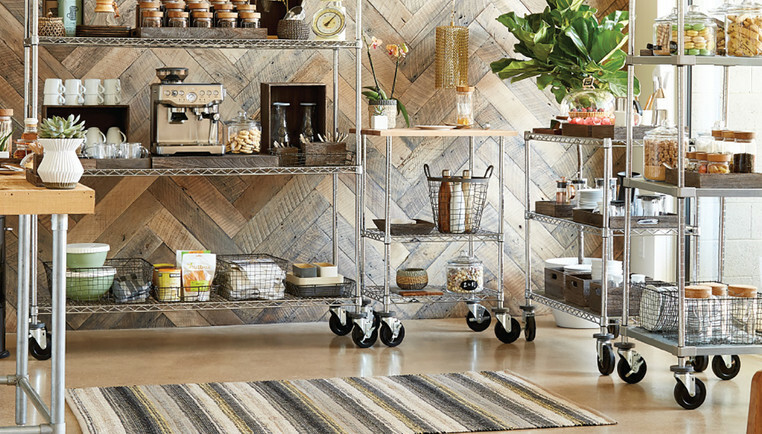 Add hooks and tool racks to complement your shelving solution. Steel shelving offers commercial-quality construction and stands up to serious storage needs.